Virginia Board of Physical Therapy 2.0 (Type 1)–Please check with your state board for approval as most physical therapy boards will reciprocate approval for continuing education. This course is offered to you in a distance-learning format providing advanced continuing education for health and fitness professionals who wish to specialize in training cancer survivors. This course is available for immediate download after purchase. Trainers will learn research-based guidelines for both avoiding and addressing cancer. 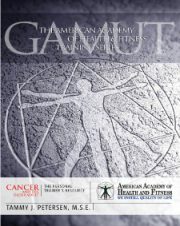 This resource identifies cancer risk factors and provides cancer prevention strategies related to lifestyle. It is an ideal continuing education program for any fitness professional who wishes to work safely and effectively with mature adults who have experienced cancer. 1. Explain what cancer is and how it can develop. 2. Identify lifestyle factors that may increase the risk of getting cancer. 3. Describe how diet, weight and exercise affect the length and quality of cancer survival. 4. Explain diet and exercise recommendations for survivors of various cancers. Certificate package with online test includes a 64-page manual and 40-page workbook in PDF format. Instructions for completing the 30-question online test and obtaining CECs are also included. Note: This program package is made available for immediate download after purchase. All materials for this program are received electronically. Nothing is mailed.